Also known as オーラ日 in the Japanese community or Orahi by mutual friends. 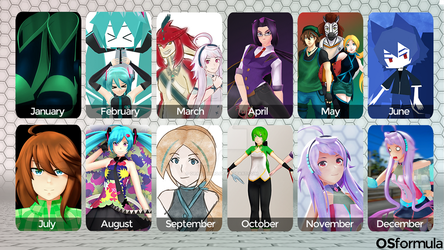 I’m Orahi_Shiro, also known as OSformula, オーラ日 or Orahi and I’m a 3D modeler since 2014 that mainly uses Metasequoia, Blender, Clip Studio Paint, Photoshop and MikuMikuDance(MMD). Occasionally I do covers with TTS Singing Synthesizers such as VOCALOID and currently I’ve done over 30 3D models based on anime-styled female and male characters, animals and Low Poly characters. SUNSHINES AND RAINBOWS AND SPARKLES!!!!!!!!!! I received reports that naked/base edits of my model are going around in some overseas communities. I'd like to express my opinion on these edits. Naked/base edits may infringe Piapro Character License. In addition naked/base edits may lead to the use for R-18 rated works. I request that naked/base edits should not be distributed. Thank you. There wouldn't be need for any type of comments asking for users to follow the rules if they were respected at first place.